Gorilla is the largest ape that mostly live in the continent of Africa. Gorillas are generally categorized into two types of species. The Eastern Lowland and the Western Lowland. The subspecies of Eastern Gorillas are the Mountain Gorillas, they usually live in the tropical forests. The Western Gorillas mainly live in the forest of some other parts of the continent. Although these two types of gorillas are very similar to each other, they have some major differences that differentiate them from each other. 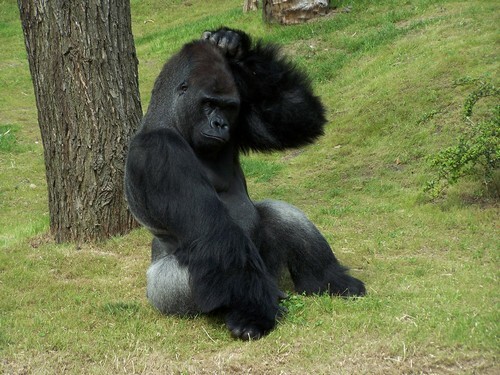 Mountain gorilla can also found living on green volcanic mountains and wear longer hair as compare to lowland gorilla which has a shorter and softer hair. Lowland gorillas usually live in bamboo forest and swamps. They have black skin and hair but they don’t have hair on their face, hands and feet. They also have distinctive nose prints same as human fingerprints, which can be used as their identification. 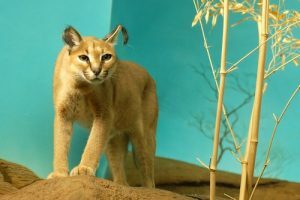 They are closest to humans, as a matter of fact they share more or less 95 percent of DNA with humans and our 2 species obtained from the same ancestor. Another major difference between these two species is their size. Lowland gorillas can grow up to four to six feet and can weigh up to one hundred fifty to four hundred pounds. Mountain gorillas and lowland gorillas are almost the same height, although the Mountain gorillas are a little heavier with weight of up to 300-485 lbs. and height of 4-6 ft. According to studies, they are considered as the world’s largest primates. 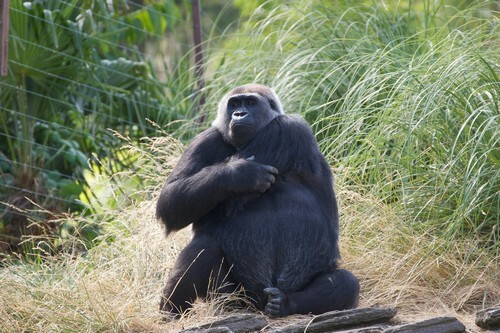 Lowland gorillas are mainly vulnerable to human diseases. 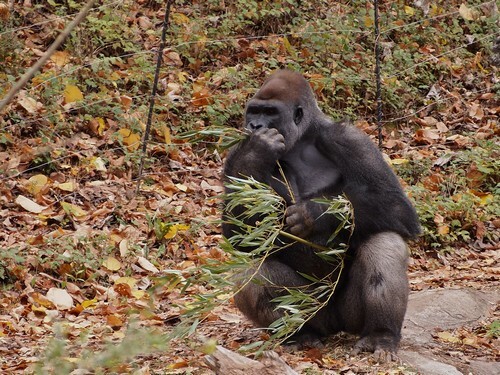 Another subspecies of Western gorilla is the Cross River Gorilla. 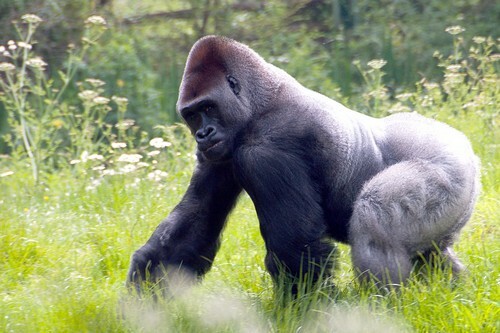 This type of gorilla is also a herbivore but sometimes can eat invertebrates. Similarly Afi Mountain subspecies consumes herbs belonging to genus Aframomum. Did you know that a group of gorillas can have their territory of up to 16 square miles or 41 sq kms.? Gorillas are typical herbivores. They only eat vegetables and vegetation’s such as shoots, wild celery, tree bark and tree pulp, roots, and different types of fruits. 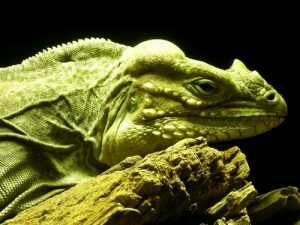 They can also eat some small animals and insects. A male can eat up to forty pounds of vegetation every single day. Gorillas’ diet also varies depending on their habitat. About 67% of a lowland gorillas eat fruits; while the mountain gorilla eats 86% leaves plus shoots and stem. Gorillas considered as seed dispersers in the forest, they scatter the seeds from the fruits they eat which is the reason why they play an important role in the ecosystem. Gorillas live in groups called troops or bands, it usually consist of up to fifty members while the least consist of 2 members only. The powerful male leads the troop called the silverback. The adult male leader usually makes decisions, govern movement, reconciliate conflicts and they also protect young gorillas against predators. Some male gorillas start a fight with the silverback which is the leader of the group so that they can have a chance to become new dominant male of troop, taking place the former silverback. In some other cases females may join the male to form a new group that will increase its members. In case the silverback dies, there is a big chance that other males may breed with females and become a new dominant male or leader of the group. Gorillas do not sleep at same place more than two successive nights. Female gorillas try to be closer to male dominant gorilla. Sometimes they even fight in order to be nearer to the male gorilla. Female gorillas usually spend their time quietly while making nests for their infant gorillas, grooming each other or their infant, they may also be found searching for food or taking a nap. Whenever a young gorilla challenges an adult gorilla, the adult rage and produce sounds like they are screaming and will start to beat their chest rapidly to show strength. Seeing this, most of young gorillas will simply backup to avoid any battle. This act is important as the adult gorillas are giving the immature gorillas a warning not to challenge them otherwise they will have to fight with them. Like humans, gorillas have a daily schedule of activities, Mornings and evenings are time for eating, they take a nap in the midafternoon, play and groom one another then they will settle down at night. Their beds are made of leaves and sticks from stem of a tree. Just like human females, female gorillas’ pregnancy can last for about nine months and usually give birth to only one offspring, they cannot give birth to more than one offspring at a time. Newborn gorillas only weigh about 4 pounds at birth. An infant Gorilla can start to crawl at around two months and can walk by reaching nine months of age. They stay with their mothers for three up to four years. Young gorilla travel by riding on their mother’s’ back. Gorilla’s maturity age is about 7-10 years old, the time when they will left their mothers and find their own mate. An adult male gorillas can reach up to 1.7 meters and can weigh around 135 – 220 kg in the wild while the adult female gorillas can reach up to 1.5 meters and can weigh around 70 – 90 kg in the wild. Gorilla’s arms are much longer than their legs, the reason why they have a particular walking style. Letting them to walk on all four limbs while still remaining upright. The Gorillas are also very intelligent just like humans. They can use simple tools like rock and bark and learn sign language just like our ancestors. 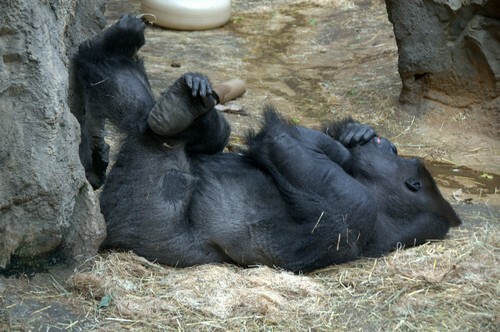 Gorilla’s comfy beds are called nests. Some make nests in tall trees while others make on flat grounds. Another fascinating fact about gorillas is that they can’t swim. They also get water that their body needs from the fruits and dew moisture which is sufficient enough for their survival. The large and muscular bodies of gorillas always need an enormous amount of food that contain enough nutrients. Although they are herbivores, sometimes they choose not to eat fruits and eat herbs and foliage’s instead just like monkeys. It is interesting to note that the two species of gorilla have sub-species and they all have different kind of diets. In areas near human population, gorillas are fond of eating crops and other vegetables grown by humans. 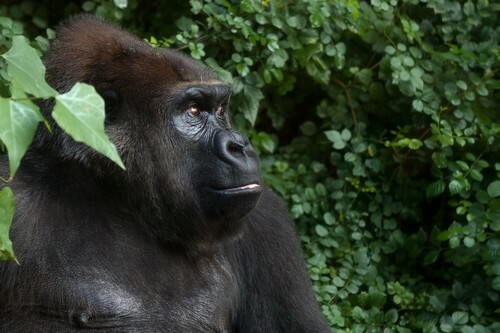 Interestingly eastern gorilla may walk up to 1000 meters per day in search of their food. Gorillas tend to receive low nutrition by eating fruits, barks or stems that’s why most of their time are spent in eating activities so they can eat as much as they can and gain more nutrition that their body needs. Lowland gorillas can travel a considerable amount of distance in search of their food. It’s a part of their feeding activity and necessary for their proper growth. Once they find their food which is usually plants they will simply tear off its parts using their teeth. As a matter of fact, they don’t have difficulties in doing so because of their tremendous strength. Due to their enormous size and muscular body, gorillas can be perceived as violent and dangerous but contrary to this impression, they are actually gentle primates and extremely shy unless of course they are provoked and disturbed. They let other animals to search for food in their territory as a proof of their gentleness. 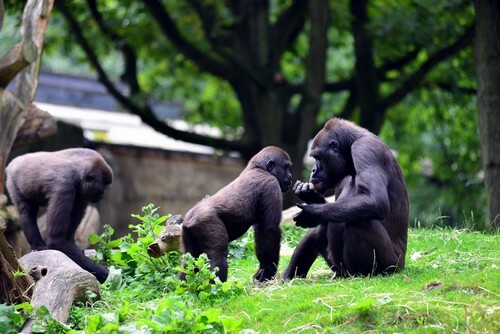 Gorillas are socially active animals that love to socialize like other primates. 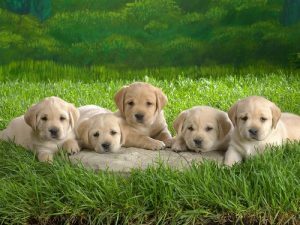 They have strong social bonds that protect them from severe condition of environment. Dominant males are responsible for protection of gorilla females and children. Gorillas can make almost 20-25 different kinds of sounds that are known to researchers but there are still many of them that are not yet known. They can scream, roar, grunt, growl or hoot. They can even laugh and make fun of each other or taunt other gorillas like we humans do. There are some researchers who believe that gorillas have the capability to think and view the world in a spiritual way which means they have solicitous relationship with the world. They have the ability to show empathy, they can follow rules and be imaginative in the world they belong. Gorillas’ lifespan is about thirty-five years in the wild and over fifty years in captivity. 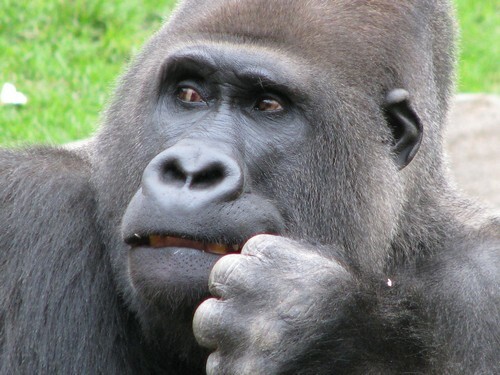 The oldest gorilla that was ever recorded is 59 years old, a western gorilla that was raised by a zookeeper. The population of Eastern lowland gorilla have rapidly decreased to below 5,000. They are considered as critically endangered, more or less there are only 300 Cross River gorillas. While the Mountain gorilla is another endangered subspecies, their number is only around 700. There is a recent study and survey that there are more or less 150,000-200,000 western lowland gorillas alive. Gorillas are endangered species primarily due to loss of habitat and they are being hunted by humans, their only predator.